Charlie grew up in Minneapolis, MN, and later attended the Indiana University Kelley School of Business. After graduation, Charlie returned to Minneapolis for a corporate supply chain job, but soon after left for Colorado. Wanting to make a move to Restaurants and Hospitality, Charlie chose Colorado because of the growing industry and his love for outdoor sports, like skiing. He spent 4 years working in Vail Valley and the surrounding mountains before moving on to work at Elways & Mountain Standard. Charlie later became the General Manager of Oak at Fourteenth in Boulder. After this, he moved to become the Senior Food and Beverage Director at Departure in Cherry Creek. He is very excited to join the Safta team as the General Manager! Chris Rogers grew up in West Texas before moving to Greeley, Colorado to complete his Bachelors and Masters degrees in Vocal Performance. After performing professionally in Texas, Colorado, California, Germany, and France, Chris realized that opera was not his true passion and gave up music in the pursuit of wine. He then went to work for Bobby Stuckey at Frasca Food & Wine where he worked his way up the ladder to front captain and a member of the wine team. After a brief stint in beverage distribution, Chris has joined the Safta family as a manager. His passion for wine and hospitality is at the heart of his drive to ensure that every guest has a memorable experience. He hopes that you will come in excited to try new from Israel and around the world to enhance the incredible food prepared by this team! Caroline is a native of Lexington, KY who first developed her love for all things culinary in her grandmother’s kitchen. She is passionate about good food, art and travel and the experiences they help create. These mutual loves guided her to study at Tulane University in New Orleans, LA where she graduated with a degree in Spanish. She has since lived in Argentina, Sicily and Spain, completing her Master’s in Event Planning and Management at the Instituo Europa di Design in Madrid. She moved back to Lexington in 2016, where she completed a B.A. in Studio Art at the University of Kentucky. Caroline is beyond excited and proud to be a part of the dynamic management team at Safta promoting culinary growth, culture and creativity in Denver. Outside of work she loves traveling, writing postcards, making art, and always enjoys a good glass of wine. Liz hails from Southern Maine, where she grew up in a small town near Portland. She studied English and Psychology at Colby College, and it was during this time that she began working in restaurants. After a short stint with Union Square Hospitality group in New York, Liz returned to Portland where she expanded on her love of food and wine, eventually taking over the beverage program at Vignola/Cinque Terre. She later established herself in a team of like-minded individuals at Woodford Food & Beverage, where she began to see the positive impact that a restaurant could have on its community. She parted ways with Woodford F&B when she and her husband moved to Denver, where she discovered Pomegranate Hospitality and a new team of like-minded individuals. Liz is extremely passionate about hospitality and involvement in her community. She is thrilled to further these passions here at Safta! Josh began his career in food service in Boulder, Colorado working as a cook in restaurants while attending college. 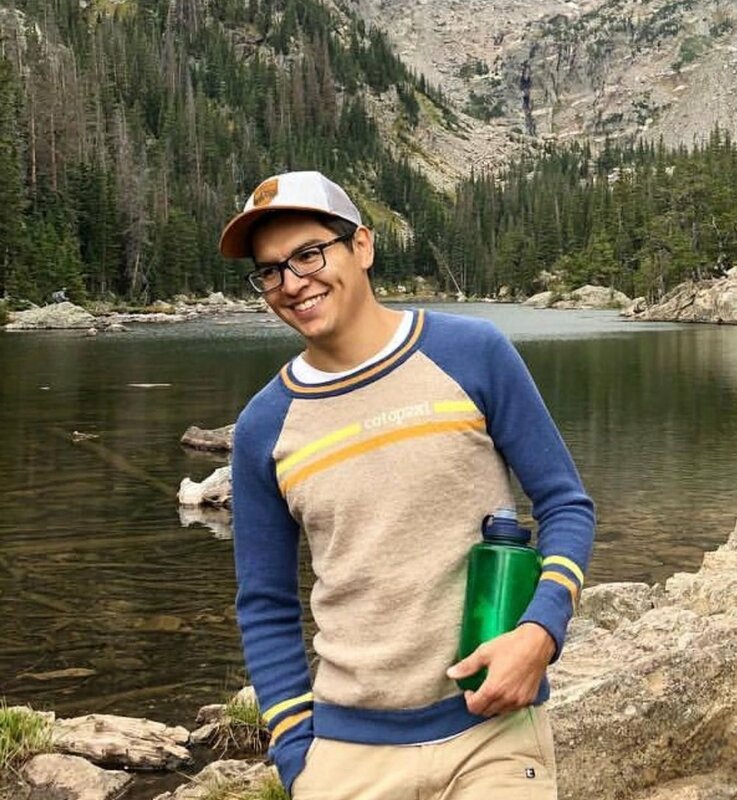 Realizing a passion for food, after graduating from CU Boulder, he attended the Culinary School of the Rockies where he gained a foundation in cooking technique and culinary arts. After working for several years in a local fine dining restaurant, he then moved back to his hometown of Chicago for several years of product and flavor development and corporate culinary work. But, the mountains were calling his name again, and Josh moved to Bozeman, Montana where he became the chef of a modern Mexican restaurant. After 4 years years in Bozeman, he returned to Denver and joined the crew at Safta. When he's not working, he can be found skiing or on one of the local mountain bike trails, he also loves to research and try different cuisines, the unique menus of Chef Alon Shaya is part of what attracted him to join Safta. Liliana Myers has been in the food industry since her days working at Lindell Delicatessen in her hometown of Long Beach, New York. After graduating from high school, Myers moved to Pittsburg to study Chemical Engineering at Carnegie Mellon University. After one year, she headed to New York City to pursue her true passion – pastry. Myer’s informal education started at Thomas Keller’s Bouchon Bakery, where she worked as a pastry cook. It was there and at Bar Boulud that Liliana learned to perfect the production of macarons, and developed a love for French pastry. She decided to move to France where she landed a position at La Feniere as a pastry and savory cook. Here, she produced desserts for both the Two Star Michelin gastronomique restaurant, as well as the bistro. After returning to New York, Myers worked as a pastry sous chef at various French restaurants, including the One Michelin Star restaurant Rouge Tomate, where she created sustainable and nutrition-forward desserts, aligning with the restaurant's ethos. In 2013, Myers relocated to Boulder, Colorado, where she worked as Executive Pastry Chef at The Mediterranean Restaurant, Brasserie 1010, and Via Perl, with some front of house experience as General Manager at The Bakery at the Mediterranean. Liliana is excited to join the team at Safta, where she'll create desserts and pastries to reflect the modern Israeli menu, celebrating the region's signature ingredients like orange blossom, pistachios and figs. Chef Nohe was inspired by the El Salvadorian foods of his childhood with his father and has also mastered creating warm and hearty dishes from the American cuisine palate. Weir-Villatoro started his culinary career washing dishes when he was about 17, and went to work as a line cook in various restaurants in Asheville, NC from there. After breif stints at The Admiral and Zambra in Asheville, Chef Nohe worked as Chef Steve Goff’s sous chef at King James Public House. After the departure of Chef Goff, Chef Nohe took the reigns as executive chef at King James. He then moved to Colorado and worked as a Sous Chef, and later as Chef de Cuisine, of Old Major. He is excited to join the Safta team as sous chef. Joe grew up in Lincoln, Nebraska where his love of great food came at a young age thanks to his mother. During high school, Joe became a dishwasher at a fine dinning restaurant in Lincoln, and then later moved to working as a line cook. After five years of working in restaurants in Nebraska, he decided to move to New York City and go to culinary school at the International Culinary Center. This also led him to attend Alma culinary school in Colorno, Italy. After graduating from ICC, Joe worked at ABC Cocina for two years and then Jean-Georges for a year and a half. He then decided to move back toward the Midwest to be closer to home and closer to the Rockies! He is excited to join onto the Safta team.